Inventory We are a resale marketplace, not a box office or venue. Ticket prices may exceed face value. This site is not owned by CenturyLink Field . CenturyLink Field is a multi-purpose stadium in Seattle, Washington, United States. It serves as the home field for the Seattle Seahawks of the National Football League (NFL) and Seattle Sounders FC of Major League Soccer (MLS). It was originally called Seahawks Stadium but was renamed in June 2004 when the telecommunications carrier CenturyLink acquired naming rights. The complex also includes the Event Center with the WaMu Theater, a parking garage, and a public plaza. The venue hosts concerts, trade shows, and consumer shows along with sporting events. 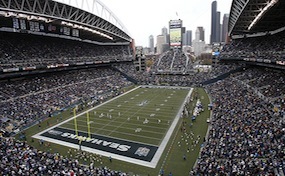 Located within a mile (1.6 km) of Seattle's central business district, the venue is accessible by multiple freeways and forms of mass transit.The crowd at CenturyLink Field is notoriously loud during Seahawks games. The noise has contributed to the team's home field advantage with an increase in false start (movement by an offensive player prior to the play) penalties against visiting teams. The stadium was the first in the NFL to implement a FieldTurf artificial field. Numerous college and high school American football games have also been played at the stadium. FieldSeattle.com is not affiliated with any primary box office or supplier. We are a privately owned and operated business specializing in sales in the secondary market. To buy tickets for any CenturyLink Field events in Seattle simply click on the event of interest or call our operators at anytime.